Leah Hogsten | The Salt Lake Tribune Ogden's Diego Alvarez (right), shown here during a bout in 2016 when he defeated Paul Jerry of Washington, DC, won the Rocky Mountain Regionals championship Saturday in the 132-pound weight division and will advance to nationals for the third straight year. If you’re driving through Twin Falls, Idaho, anytime soon and see a “driveway full of kids jumping rope,” you will have come across the home of national Golden Gloves boxing champion Kendra Reeves, who has started a training gym with her fiancee, Jason Samargis. Weighing more than 220 pounds, Reeves, 25, took up boxing in January of 2017 as a way to lose weight. She’s dropped more than 74 pounds and now loves the sport so much she teaches it to dozens of youngsters in southern Idaho. She had been boxing only a little more than a year when she went into the National Tournament of Champions last year in Omaha, Neb., ranked ninth in the country. Naturally, she won the championship, upsetting the No. 1-ranked contender, Stephanie Malone, in the 152-pound weight division final. 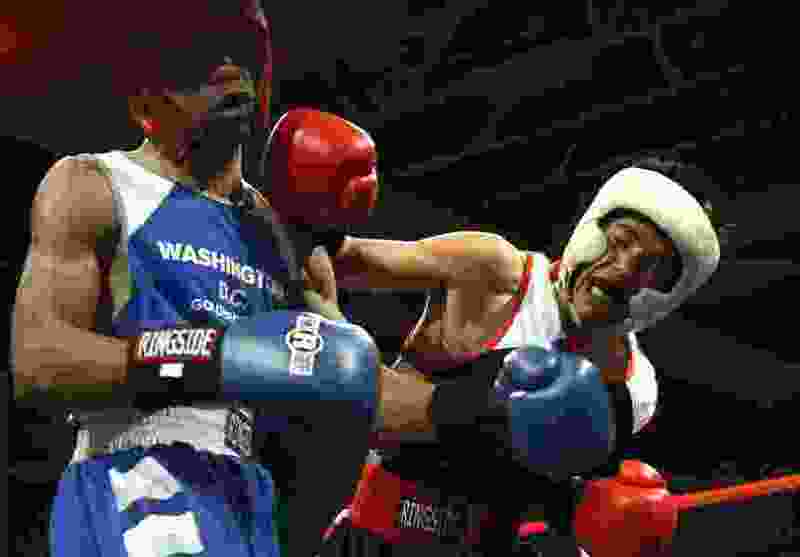 Reeves dominated Deseree Jamison of Louie’s Boxing Club of Salt Lake City on Saturday afternoon in the Golden Gloves Rocky Mountain Regionals at the Salt Palace and is headed back to nationals, which are in Chattanooga, Tenn., next month. “I get excited for all my fights, but especially this one,” Reeves said of the rematch with Jamison. The Reeves-Jamison bout was the only one Saturday in the event held in conjunction with Fitcon that featured female fighters. Maryguenn Vellinga-Hinz (112), Stephanie Mendoza (125), Jackie Barco (132) and Madeline Waltman (178) were unopposed and will also represent the Rocky Mountain Franchise in Tennessee. The most dominant male boxer Saturday was 21-year-old Felipe Nino of Louie’s, a Granger High graduate who is also on the United States Marine Corps boxing team. Nino won by TKO over Martin Gordo of Razor’s Edge Boxing in Idaho in the 141-pound division. Nino has been boxing since he was 12 and has the goal of making the U.S. Olympic team and then turning professional. Reeves wasn’t the only national champion on Saturday’s 10-bout card. Ogden’s Diego Alvarez advanced to nationals for the third-straight year with a decision over Antonio Landeroz of Wyoming in the 132-pound division. Alvarez, 19, won his national championship in 2016 at the Salt Palace when Salt Lake City hosted nationals. Alvarez is still trained by Lalo Lopez, whose Los Gallitos Boxing Club has moved to North Ogden. Clearfield’s Jon Bryant of Lights Out Boxing Club and Salt Lake City’s Danny Galloway also won bouts to advance to nationals, as Bryan beat Daniel Bestie of Idaho and Galloway downed Austyn Branco of Idaho. Matt Searle (114), Jay Wright (123), Halatoa Piutau (178), Robert Martinez (201) and Juan Higurera (201-plus) were unopposed and will represent the region’s male team in Tennessee. In exhibition bouts, Utah’s Jayden Lopez defeated Utah’s Robert Chairez at 135; California’s Chris Valdes defeated Thanjhae Teasley of Foley’s Gym in Utah at 145; Alizon Ramos of Fullmer’s Gym in South Jordan defeated Fernando Gutierrez, also of Fullmer’s, at 130; Jonathon Garcia of Idaho defeated Elijio Fernandez at 160; Matt Searle of Fullmer’s defeated Jay Wright of Foley’s at 123.